Inspire Gear - Jewelry - LIVE, BELIEVE, INSPIRE. Please allow 5 to 10 business days for items to ship as they are made to order. ​Tracking number will be sent upon shipment of items. Thank you for the love and support! New Collection currently being created and processed. Please allow at least 3 weeks to create and process the orders. Do you sometimes find yourself feeling burnt out, unmotivated, tired, anxious or just overly emotional? This could be a sign that your chakras are out of whack. Chakra balancing is vital to our health and well being, and is something that often goes overlooked during our hectic lives. 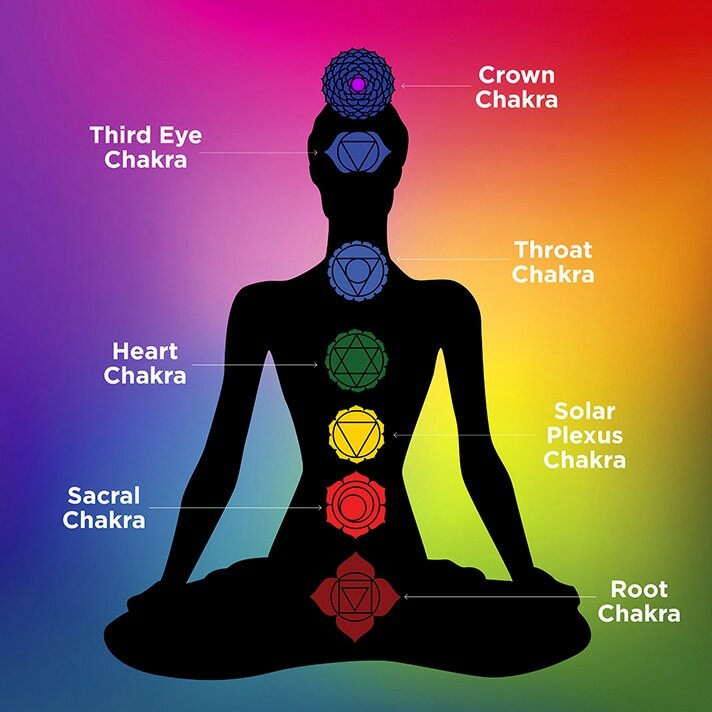 Running from the base of the spine to the top of the head, the 7 Chakras are centers of spiritual power, or wheels of energy, that flow through the body. Each of the 7 chakras is associated with a color, physical & emotional aspect. When your chakras aligned, balanced and cleansed, you will feel re-energized, emotionally balanced and ready to live life to the fullest. 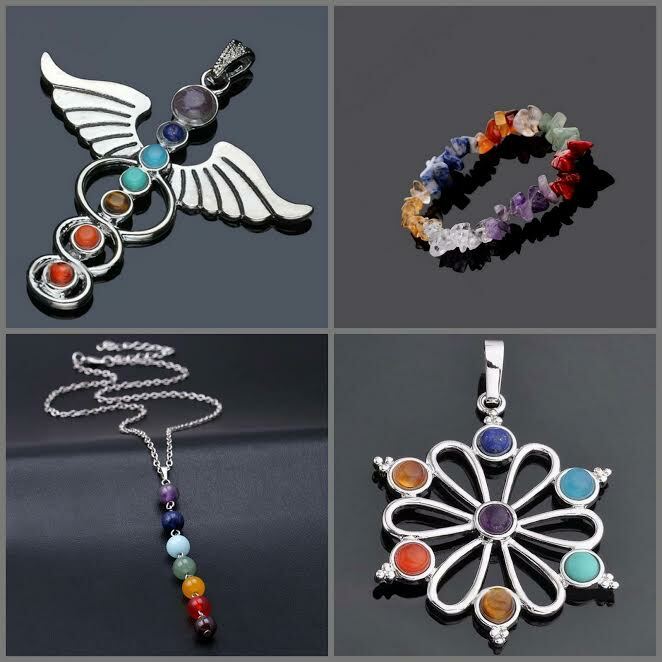 There are many ways to get back into balance and the new Reiki Chakra Collection is just one small way. “Reiki” (ray-key) is Japanese for ‘universal life energy, and is also a word used to describe a system of natural healing. The goal of Reiki Energy Healing is to provide you with the tools that you need to fully heal yourself. Reiki is a beautiful, gentle form of healing that uses Universal Life Force Energy to remove any blocks caused by physical, mental, emotional or spiritual distress. Once these blocks are removed the body is then better able to heal itself naturally. Anybody who has ever observed a lotus flower emerging from a murky pond cannot fail to see the beauty of this exquisite plant. The flower always looks so clean and pure against the background of the dirty pond. The ​lotus flower is mainly considered as a symbol of rebirth since it rises from darkness and turns into a beautiful flower with pink and white petals much like a human being born from nothing and turning into something complete and beautiful. ​Clear Quartz is known as the "master healer" and will amplify energy and thought, as well as the effect of other crystals. It absorbs, stores, releases and regulates energy. Clear Quartz draws off negative energy of all kinds, neutralizing background radiation, including electromagnetic smog or petrochemical emanations. It balances and revitalizes the physical, mental, emotional and spiritual planes. Cleanses and enhances the organs and subtle bodies and acts as a deep soul cleanser, connecting the physical dimension with the mind. Clear Quartz enhances psychic abilities. It aids concentration and unlocks memory. Stimulates the immune system and brings the body into balance. Clear Quartz (Crystal Quartz, Rock Crystal) harmonizes all the chakras and aligns the subtle bodies. Fairies symbolize magic in it's purest form. Those who are drawn to fairies are the ones who accomplish the impossible. They are dreamers, visionaries and they believe in the true power of magic. ​Lapis Lazuli - A stone of protection that may be worn to guard against psychic attacks, Lapis Lazuli quickly releases stress, bringing deep peace. It brings harmony and deep inner self-knowledge. Encourages self-awareness, allows self-expression and reveals inner truth, providing qualities of honesty, compassion and morality to the personality. Stimulates objectivity, clarity and encourages creativity. Lapis Lazuli assists to confront and speak one’s truth and inspires confidence. It bonds relationships, aiding in expression of feelings and emotions. Elephants are know for thier Majestic Nature. Buddha spirit and elephant spirot combine in this beautful piece! Box in image is not included but this item will be gift wrapped. Like the Goddess, Elephant has an intense focus on family, including past and future generations. Indeed Elephant’s mantra could well be, “family first.” Elephant challenges you to protect the young and weak of your tribe, while also recognizing the amazing extended family unit and how Powerful love and loyalty become when shared. Note, however, that Elephant intuitively knows that not all “family” is bound by blood. This is a absolutely beautiful peace! Rainbow colored semi precious gemstone chips hand twisted into leaves and branches. Comes with black Chord fully adjustable necklace. Tree of Life - A symbol of connection to all things. The tree has roots that reach deeply into the soil, acknowledging its connection to, and accepting nourishment from, Mother Earth. Leaves and branches extend into the sky, acknowledging Father Sun and accepting the energy that it transforms into nourishment. This charm itself is about the size of a quarter. The chain is adjustable (22") and made of Alloy. Genuine Tigers Eye semi precious gemstones. Tigers Eye Stone is a crystal with lovely bands of yellow-golden color through it. This is a powerful stone that aids harmony and balance, and helps you to release fear and anxiety. It stimulates taking action, and helps you to make decisions with discernment and understanding, and unclouded by your emotions. Open Copper Bracelet with 7 Chakra natural gemstone beads. Reiki Infused. Copper is used in the treatment of wounds and skin diseases, as well as internal diseases, anemia, cancer, rheumatoid arthritis and heart disease. It can also help improve the circulation of blood, increasing energy and detoxifying the body. It is used to bring along energies for all types of healing, including the treatment of arthritis, pain relief of broken bones, as well as sexual instability and low energy. Copper jewelry has been found to relieve joint stiffness and arthritis by opening the flow of blocked energy. It is considered a mineral to increase energy and mental agility. In legend, it is said to be the metal of the God Hermes, who facilitates mental agility. It is said to alleviate cramp-like symptoms. It can also promote the smooth functioning of the glands, and can help prevent wear, tear and calcification of the joints. The Crown Chakra is about wisdom and being one with the world. Violet is the color of Spirituality. It is the color of people seeking spiritual fulfillment. Purple represents transformation, creativity and spiritual awareness. It is a protective, wise and a royal color. Tibetan Wood Beads with a lucky Chinese coin. These are prayer beads or Malas very good for meditating and setting daily intentions and reminders. Extremely light weight and very comfortable. New fall collection. Made with the intention to aid in letting go of the old without fear. Tree of Life centered surrounded by turquoise gemstones. Turquoise carries great wisdom of basic truth within it. It is one of the oldest stones known. ​Strength, protection from harm, psychic sensitivity and connection to the spirit world. One of the best words I have to describe the season of autumn is bittersweet. It is a time of many moods, some sad and some inspirational. How can we not be moved by the dramatic changes of color, the cooler weather, the descending darkness, and the barren branches contrasted against the stark sky. As we see time and again during the fall, the trees shed their leaves as part of the cycle of renewal. This is a universal principle – in order to grow, we must release something. This is true of our own bodies in ways we don’t even notice; we are constantly shedding old cells and creating new ones. If our physical bodies didn’t have this process, we’d have a much shorter life span, as the old tissues would wear out rather quickly. However, there is a more subtle process at hand in our psyche. Here, too, if we want to grow—to continue to evolve into better human beings in every way possible—something needs to be let go of. In fact, we are in a constant process of integrating new information, aspects of ourselves, perceptions, and ideas, as we realize that old ways of doing things no longer work. Fall season reminds us that we all have out-moded parts of ourselves that we need to let go of. This allows us to sprout new ideas, improve skills, deepen our relationships, and grow on the spiritual path. The old ways, however, don’t need to be tossed into the trash. On the contrary, like the leaves that drop from the trees, they can serve as the foundation for new growth and fuel for renewal. This little piece is handmade and requires 6 days to produce. All stones are semi precious natural earth stones. One size fits all / adjustable. Buddha Centered surrounded by precious Rudraksha and Tricadna beads. - Intended to aid the wearer into the purest disocvery of self. Tridacna is the most white substance in the world, it is also a rare organic gemstone. Wear tridacna to enhance the magnetic field of human body, remove annoyance, increase wisdom and protect you. This stone helps with health care and it can boost metabolism. Tridacna can relieve palpitation, calm & soothe the nerves. It also helps remove distractions and treat insomnia. Rudraksha are considered very sacred seed. It is known to increase awareness and clarity and to still the mind, getting free from negative thoughts. Everything in the existence vibrates in a unique way. For spiritual seekers, a Rudraksha’s vibration has been identified as greatly supportive on the path to mukti or liberation. Grace is a driving force that is always there, otherwise there would not be any life. But one can make use of it consciously or unconsciously. A Rudraksha is a very important tool if one wants to strengthen their connection with Grace. One cannot thrive if he/she is not available to Grace. Grace brings about a certain effortlessness and ease in life. 8mm Lava Beads with Tibetan Buddha. The organic Lava beads are great for absorbing different types of essential oils to help you maintain a calm and spiritual harmony. Siddhartha Buddha centered surrounded by gentle wood, shell and hand carved lotus flowers. 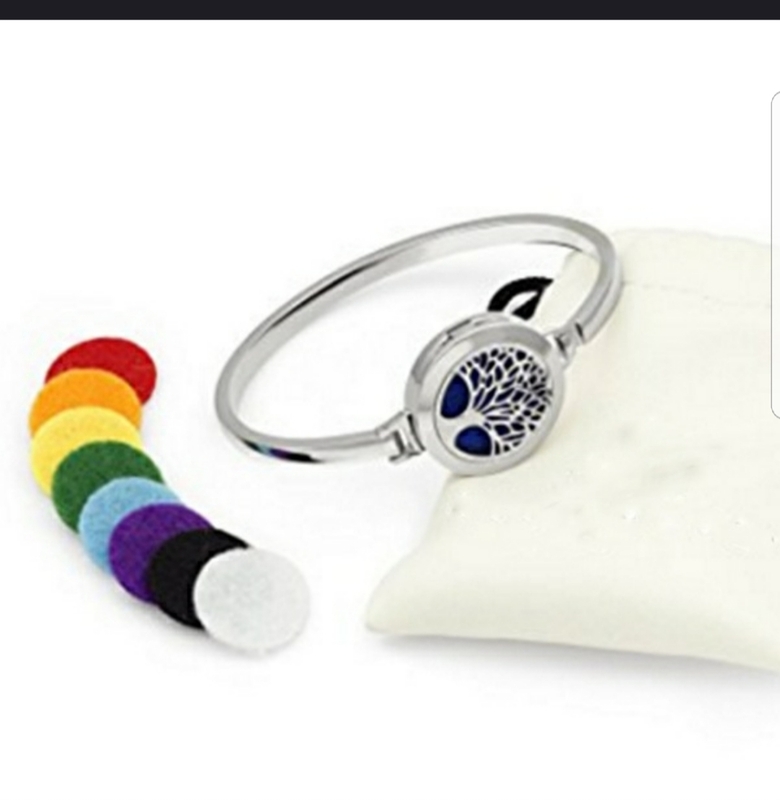 Absolutely unique - Intended to aid the wearer to be more mindful and fill their hearts up with peace. Lava stones and white agate 8mm beads. Feeling like your chakras are out of balance? This Chakra Healing and Balancing Lava Stone Bracelet restores and balances your 7 chakras getting you back to your spiritually, emotionally, mentally and physically healthy self. Rudraksha centered - surrounded by African Jade and all natural wood seeds. Super gentle energy, intended to aid the wearer to calm the spirit and listen to the whisper of the soul. Which beads do you put the essential oils on and how much? 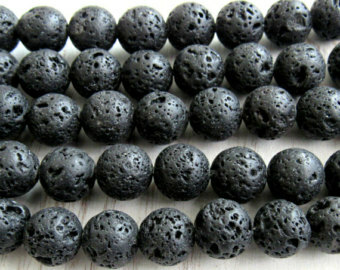 The lava beads are porous with “craters” on them. You can drop one drop of oil on each bead (a little goes a long way, so you only have to put them on a couple of the beads) and it will last 2-3 days. Where do you get your lava stones from? This is a very important question, since many cultures believe that removing lava from their source of origin is considered bad luck and disrespectful to the area (Iceland and Hawaii). 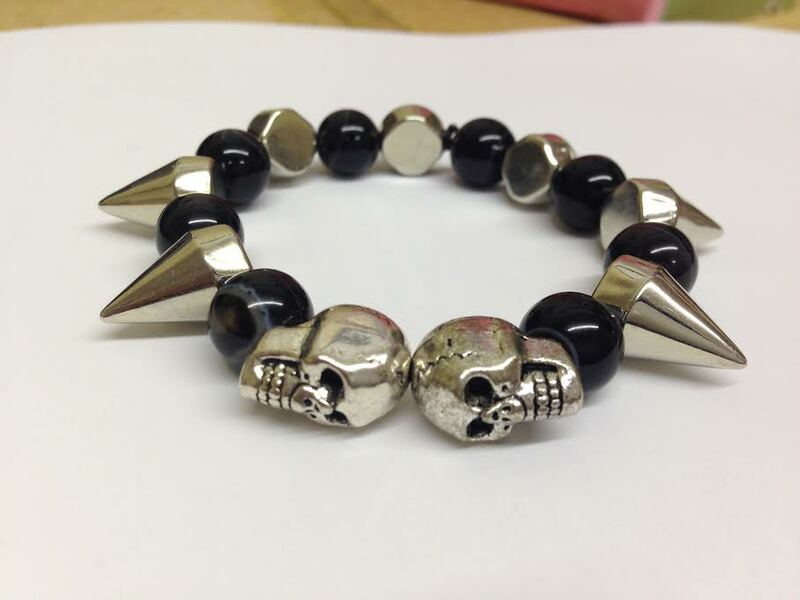 The stones are sourced from areas that have an abundance of lava and no cultural taboos about it’s removal. Can you use more than one kind of oil on the lava beads? After 2 or 3 days, the aromatherapy on the lava will start to fade. You can use more oil on them and any kind you’d like. There are certain oils that will last as long or longer than 7 days. You can reapply oils as often as you prefer and any oil that you like. 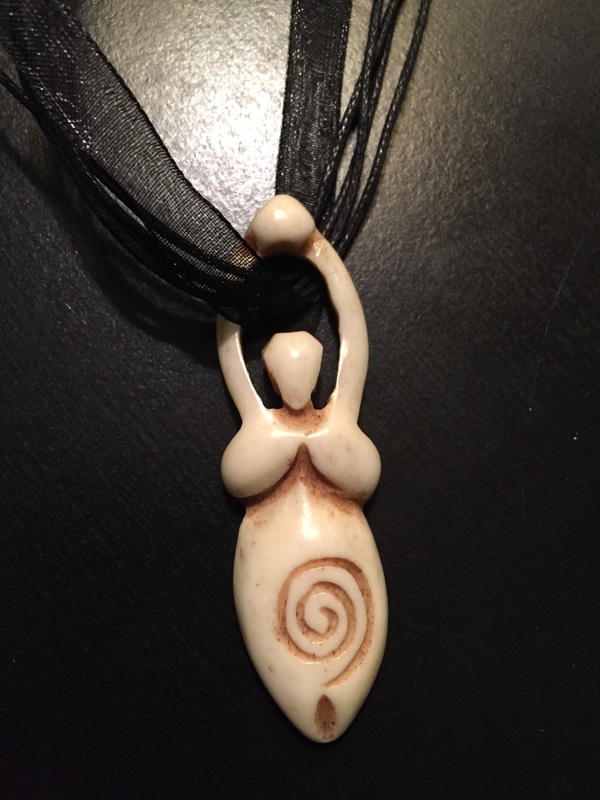 Luna Goddess Centered made of Buffalo Bone (Approx 2.5" long)- Adjustable Lace Chord. Cosmic Spiral - The Spiral, which is the oldest symbol known to be used in spiritual practices, reflects the universal pattern of growth and evolution. The spiral represents the goddess, the womb, fertility and life force energy. Reflected in the natural world, the Spiral is found in human physiology, plants, minerals, animals, energy patterns, weather, growth and death. The Spiral is a sacred symbol that reminds us of our evolving journey in life. When used as a personal talisman, the Spiral helps consciousness to accept the turnings and changes of life as it evolves. The acceptance of change is one of the greatest freedoms a human can experience, putting consciousness in the present moment where the power of creation is condensed. On a larger scale, using this symbol assures all beings are reminded of their inward and outward evolution, a balanced and centered state of mind. On water, it carries the power to flow and change. driving force that supports those in service to one another.